The theatrical adaptation of Jack Kerouac's great American novel. 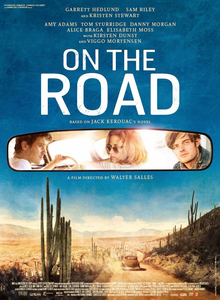 Directed by Walter Salles of The Motorcycle Diaries fame. Hopefully it'll live up to the novel. It has Kristen Stewart in it, but she was decent in the The Runaways, so I won't hold Twilight against her. Hell, maybe even the Beat and Beatnik culture will become hot again because of her involvement. Soon enough striped shirts, turtlenecks, and bongos will be in the front window of your local Hot Topic. More info. at the official website. With the invention of this machine their disasters begins. They at that moment try their best to travel back to their past days so that they may prevent them selves from all grieves and sorrows..
putlocker moviesYou can find out about the release dates of the latest films so that you can plan to watch it at your nearby theatre.